Life throws those little surprises at you sometimes right? Well, this is one of those. 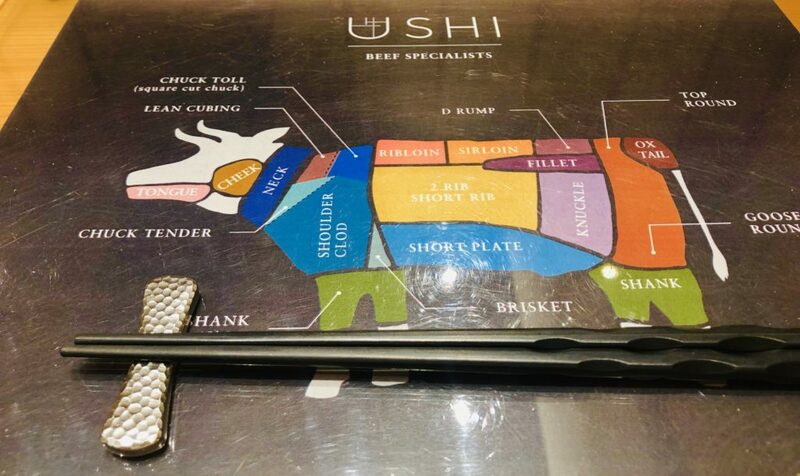 This is Ushi Pop-Up, @ St Regis KL, & Chef Uehara-San. I had to go to Kuala Lumpur for work, speaking on Digital Disruptive Decision Making. The event happened to be at St Regis @ Sentral. I was in super early for the event start, so stayed that night after the long lunch session with the clients. I have never been to St Regis before, so all this was a 1st-time experience. On checking in I could tell this was an extremely classy joint, as in bloody nice actually. The staff were amaze-balls too. At check-in, the guy was so helpful. I was all apologetic because it was 10 am and obviously way too early to get a room. But… he said; “Sir we have you down for a King single. We have no rooms available. You could come back later, or could you accept a 2-bed room?” Mate if I can get in the room now for a quick splash before the event you would be my hero. And so that is the start of Ushi Pop-Up, @ St Regis KL, & Chef Uehara-San. I get checked in at 10 am. That was WOW moment #1. Then in kicks WOW moment #2 when I walk into the bedroom. Holy COW!!! (and more Holy COW later). There was me expecting a couple of single beds in the room. Nah St Regis doesn’t do it that way. It does it like this. OMG. 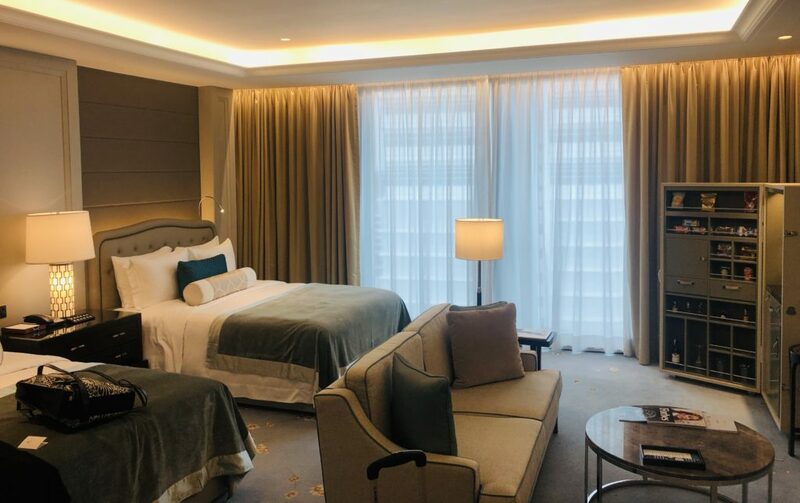 Tow massive double beds, a sofa, a walk in mini-bar and massive workstation (I could not get that in the picture the room is so big). It’s a stately room on steroids. A fat man even gets in this shot. 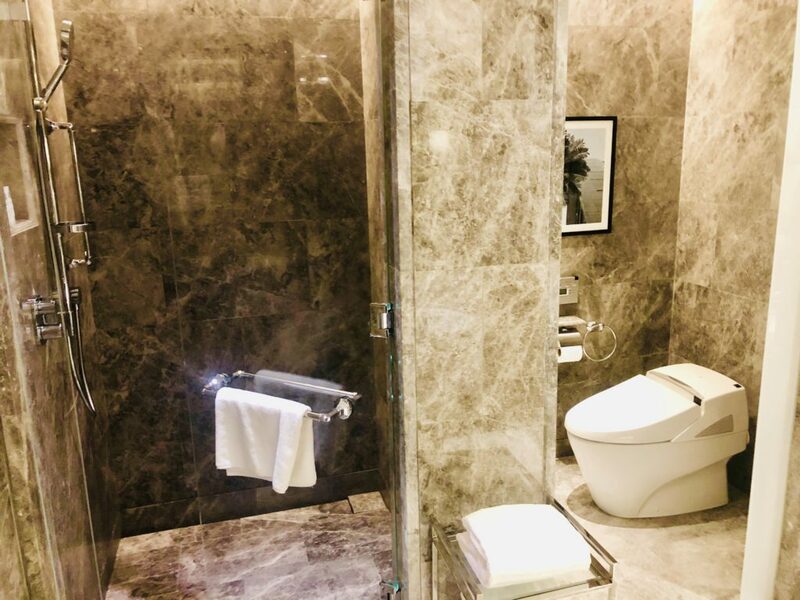 Here is my bathroom. Yep, almost same size as my condo in Singapore. 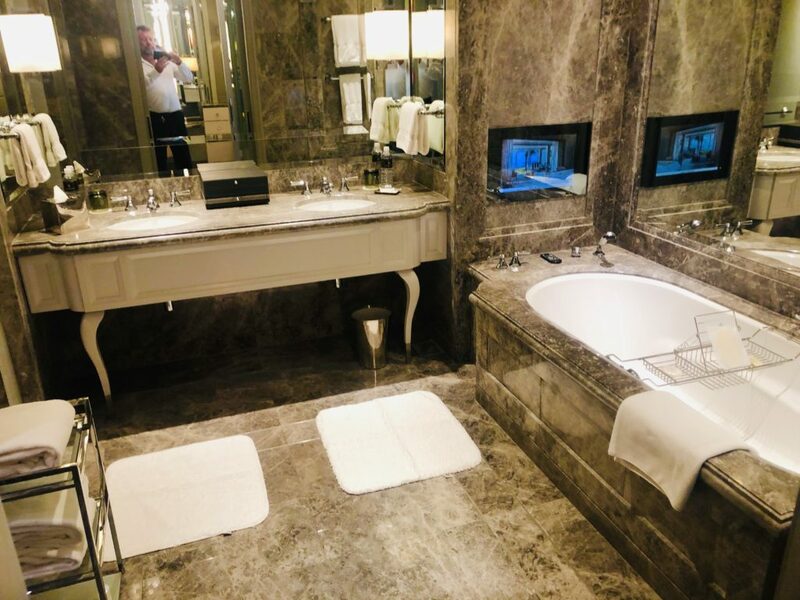 Check the bloody TV in the bath. Yeo that one caught my eye too. I know, I know. It’s a bloody toilet so what? BUT… This thing is a gadget on steroids. My Amy would have loved it. There is a remote control panel for the loo on the wall. It’s a toilet with about 14 functions, I kid you not. I was in there for hours trying them all out. I was nearly late for the customer event. 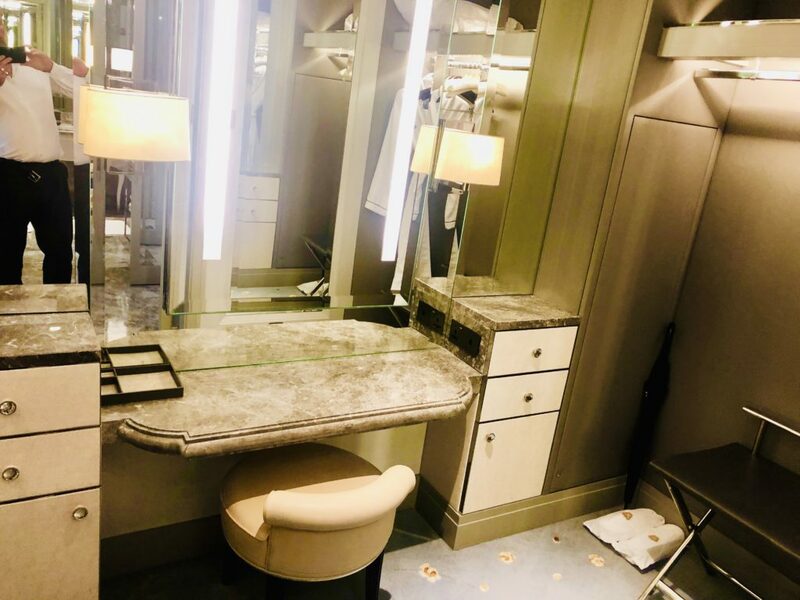 It even has a walk-in his and hers wardrobe with vanity desk. Not that I need that, I just want to go back to the toilet. I think there are 5 more functions I haven’t tried yet. For Wagyu geeks click HERE for a read up on Ozaki Beef. 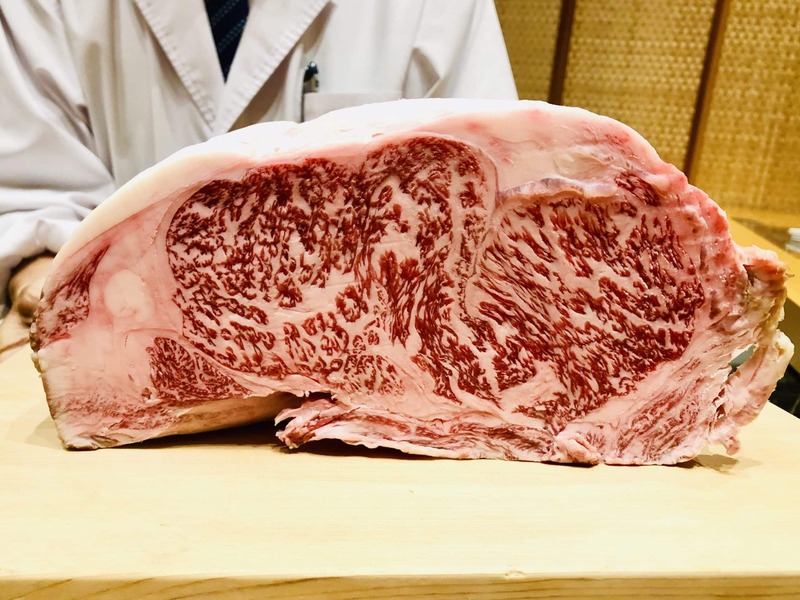 Ozaki beef refers to beef from Wagyu cattle raised on a single farm that’s owned and managed by Mr. Muneharu Ozaki in Miyazaki Prefecture. He’s the only farmer in Japan to use his own name to market his beef. The feed for the cattle is mixed every morning and evening during an extremely labour-intensive process lasting two hours. It comprises 15 kinds of feed, such as grass from the meadow, moist barley mash (a by-product of beer brewing), maize, barley, and so forth, with no preservatives or antibiotics whatsoever. 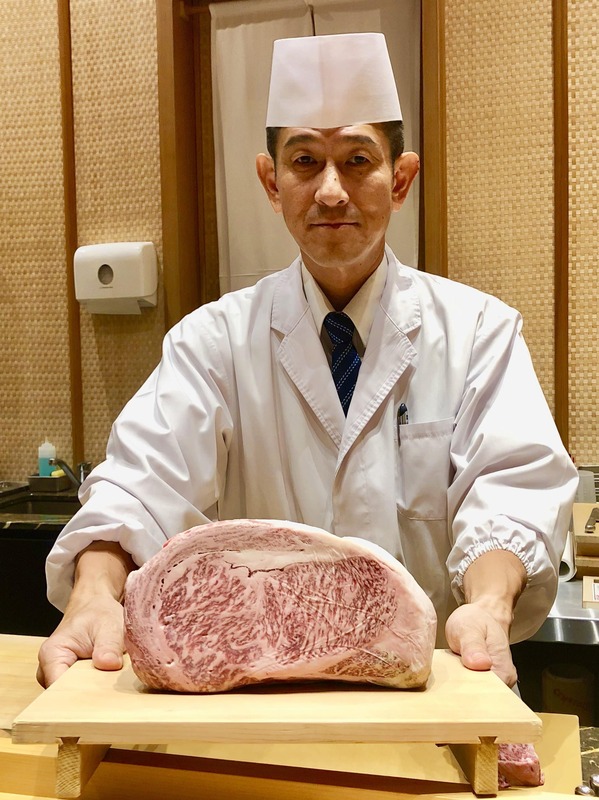 Most Wagyu in Japan are slaughtered at around 28 months, but Mr. Ozaki believes the flavour continues to improve as they mature, so he prefers to slaughter them when they’re 28 to 36 months old. That’s it. Back to the toilet to test hyper-ventilating function. I’m hooked. I have to go. And my God I am so very happy I did go. It’s up there on the $$$, yes Boss I paid for dinner myself, but worth every single cent. This is without a doubt some of the very best ever beef that has passed the beard on this old head. It’s INSANELY good. I also had the delight of meeting Executive Chef Uehara-San and his crew. The staff serving were amazing, so friendly and chatty. Be proud The Sheridan – if you have any staff award program – please put this forward as customer recognition of an incredible dining experience with the USHI crew – approx 1930 on 11/4/2019. For about an hour I was alone and had 6 staff all to myself. I even did a Facetime to wifey and Jude to bring them into the fun (virtually of course). 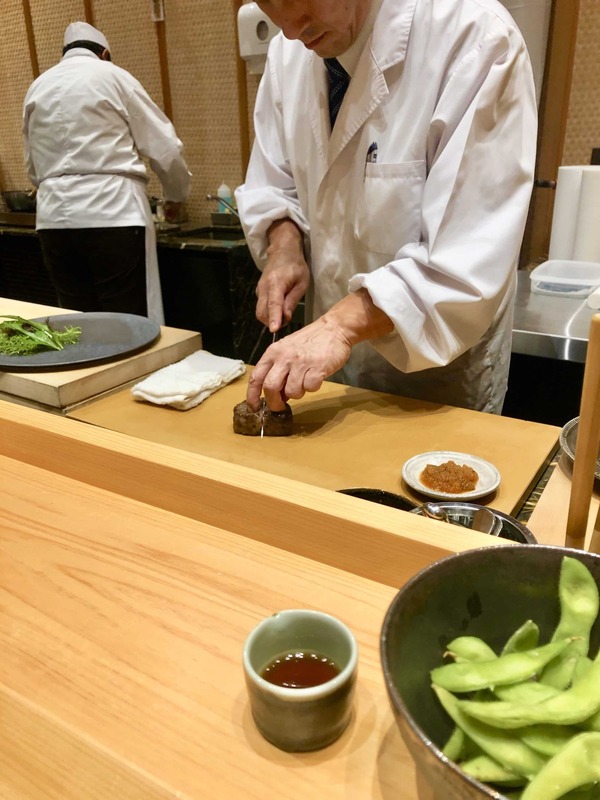 Ushi Pop-Up, @ St Regis KL, & Chef Uehara-San has been one of the very best, solo dining experiences in my 50 years on this planet. When I sat down and saw the place mate I knew this was going to be good, and of course, all then saw my tattoo and chatting commenced. 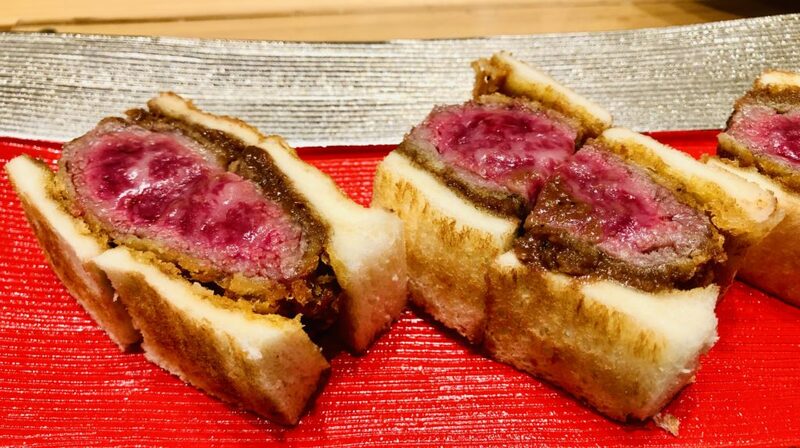 Wagyu Katsu Sando (Fried Breaded Steak Sandwich). 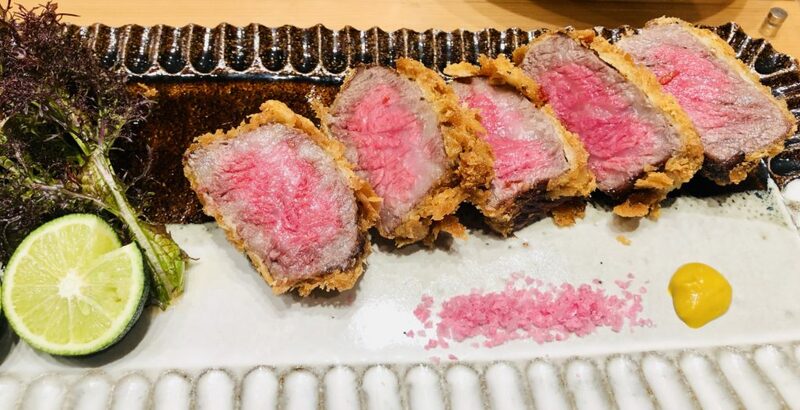 Imagine a hunk of that Wagyu, breaded with Panko bread crumbs, deep fried to rare, popped in some toasted bread with brown sauce. Fark me!!! Off the charts good. As in OFF THE CHARTS good. Best sandwich to ever by eaten by The Beard. Here is the great man himself. The quietly spoken Executive Chef Uehara-San. He is meticulous. I could have sat watching him prep, cook, and plate the dishes. Just bloody amazing to watch. Meticulous is absolutely the word. Thank you Chef for making this a cracking night. OK yes you were substantially helped by that hulking lump of the most amazing Wagyu steak. HaHa. Bit of a clue when you sit down and look at the place mats. Of course one flashed one’s tattoo, which acted as an ice-breaker, and like Dances With Wolves, I became know as He Who Loves Beef. The bill all up was $300 for three mains. But three mains made from this. I would pay that any single day of the week for this. 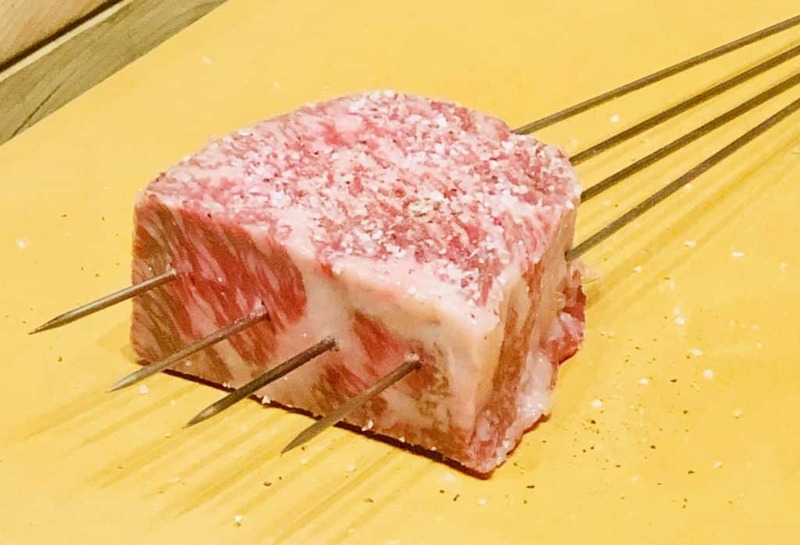 Literally, melt in your mouth beef all the way from Japan. One day I will be in the same prefecture in Japan and will be kissing and hugging the cows before I eat them. I love you!!! Here comes the simply named Grilled Beef. And that is what it is. A 100g lump of the ribloin. Simply seasoned with salt and pepper, and grilled on charcoal to perfect rare. Left to sit for an age it seemed, so perfectly warm when it gets to you. This is going to be so so good. But first. Katsu Steak. I mean come on. Angels are bloody singing here. I am literally in heaven. This is the sandwich without the bread. I had it with mustard and the cherry blossom salt. PERFECTLY cooked to rare. This was AMAZE-BALLS. You get the buttery beef and the crunch of the breadcrumbs – flavour and texture explosions. Just incredible. I can’t really say any more. If I was not married I would be on bended knee to this dish right now!!! Ooooh my grilled steak is the last dish. It’s rested and it’s ready to carve and Chef is on it. Some radish chutney to the left of him, and Sous Chef behind is grating some fresh Wasabe. I am fidgeting with excitement. Who needs a fidget spinner? Just come here. OK this is my Sumiyaki Grilled Beef. Carved by the master. Perfectly cooked. I kid you not this melted in my mouth. Chew? No need. Chef told me to try the Wasabe with a little dip in Soy sauce too, I nearly fell off my chair. So amazingly good. Then with the radish for yet another taste explosion. Or just have it naked and get hit with beef butter perfectly seasoning. Best thing since.. There you have it folks. One of the most amazing, truly amazing, food experiences of my 50 years on planet earth. Worth the $$$ believe me. If you happen to be in KL it’s a must. Come see Chef Uehara and remember me to him. 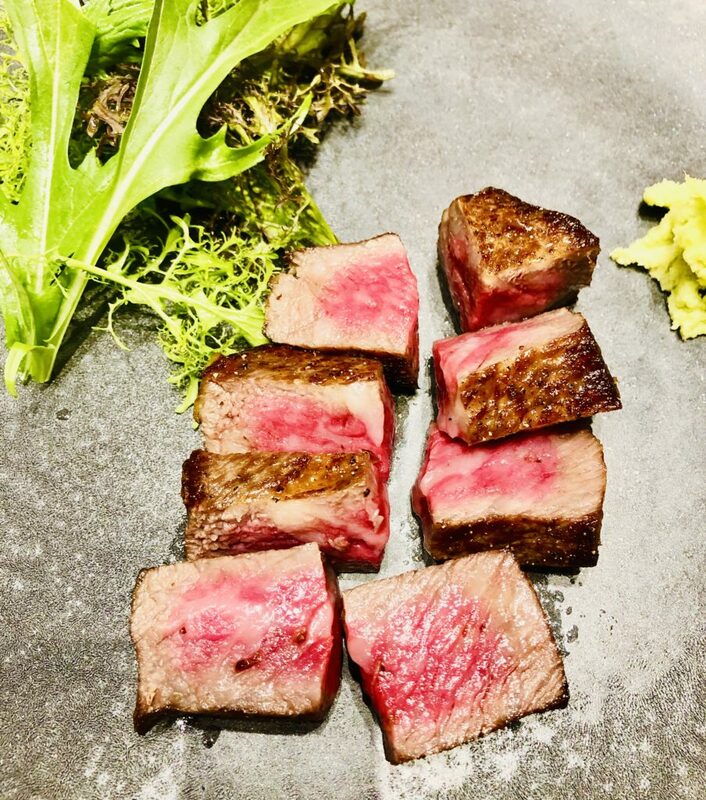 You will love this place if you like your beef, Japanese food, are a foodie. No sorry, you will seriously love this place full-stop. It’s TOP drawer cooking with the most perfect produce. I am in awe, I was in heaven, I am slightly in debt, but I will never forget. Every time I go back to Sentral I will be visiting Ushi Pop-Up, @ St Regis KL, & Chef Uehara-San. So should you, because I absolutely guarantee you will – ENJOY!!! No Replies to "Ushi Pop-Up, @ St Regis KL, & Chef Uehara-San"